This year I have been working on myself a lot. Like A LOT! I have been sticking to a regular exercise routine and focusing on eating mainly vegetarian or vegan. However, I’m nervous for the upcoming season. The holiday season. The holiday season is a favorite time of year for many and me included. There’s something about a house being filled with people you love and eating tasty seasonal foods that make Thanksgiving oh so special. I love seeing my family and stuffing my face with their homemade recipes, although most holiday recipes are filled with so many calories I’d rather not mention. Friends and family? All good things. Butter balls and candy? Not so much. I know my weaknesses and what I will be more tempted to eat, so I’ve tried to come up with solutions to overcome those obstacles. 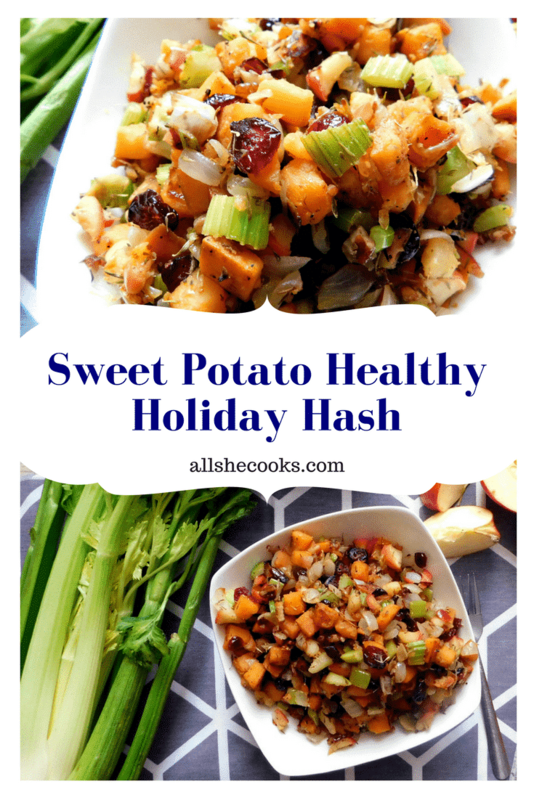 Instead of a butter filled stuffing and sugar coated sweet potatoes, I’ve combined the two and came up with my own healthy holiday hash. It combines all the flavors that I CRAVE at Thanksgiving but with out the butter, gravy or extra calories. 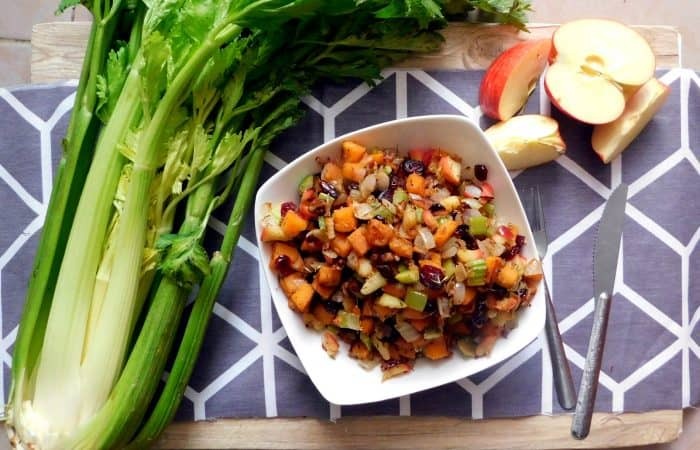 It’s veggie filled and chopped apples and cranberries bring that holiday sweetness. Onions and celery bring that savoriness to the table and a spoonful of thyme helps tie everything together and make it that perfect addition to your Thanksgiving table. If you’ve ever made hashbrowns (or even if you haven’t!) you can do this! It’s SO easy and taste just like Thanksgiving dinner. I’m excited to present this dish at holiday parties because I know with all the temptations that I will have, at least I know there will be a healthy option that still taste like the holidays. Add sweet potato to a medium pan over medium heat. 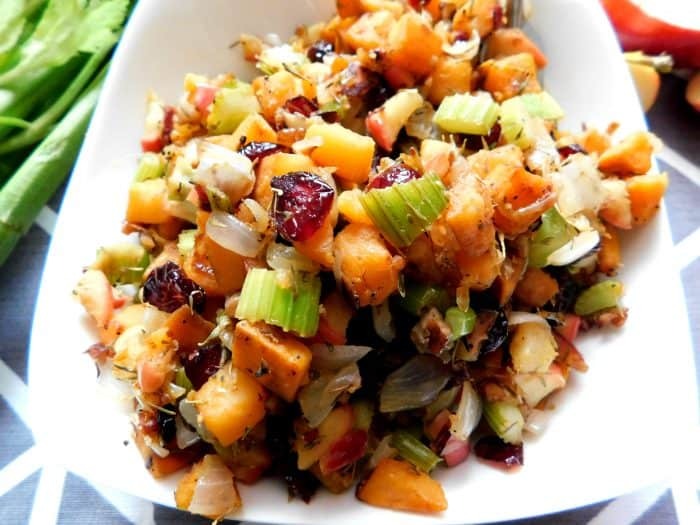 Once onions are translucent and ingredients are softened add cranberries and walnuts. I had no idea I liked hash until my best friend had me try it. I don’t know what type of potatoes she used but these seeet potatoes sounds delicious! Thanks for reading Leslie! I really enjoy this dish with sweet potatoes and it helps to give it more of a holiday flavor. Enjoy! Do you sauté the ingredients in a medium size skillet or put in pan with water? I sauteed the veggies with about a tablespoon of oil. However, if you prefer to cook with no oil you could use a few tablespoons of water instead so that the veggies don’t stick to the pan.